When the days grow colder and darker it's time to bundle the family up to get outside for some classic winter fun! Next, come inside to warm your feet by the fire, curl up with a book, bake some cookies to share, or get busy decorating for the holidays and making handmade Christmas ornaments, cards, and gifts! Below you will find lots of fun winter ideas to make the most of this exciting season! Related: ​Fall Bucket List Family Guide for the Best Autumn Ever! 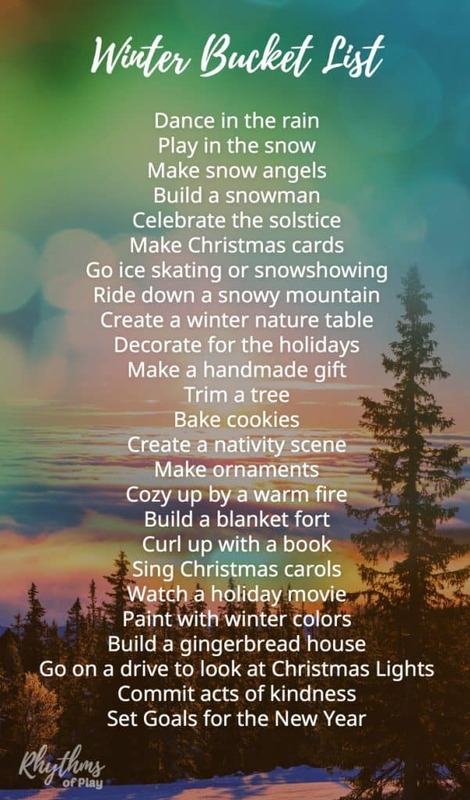 Cross off activities on your winter bucket list with some of these fun winter ideas! Dance in the rain, play in the snow, make snow angels, build a snowman, have a snowball fight, ride down a snowy mountain, go on a winter scavenger hunt, bake cookies, create a winter nature table, sit by the fire, curl up with a book, drink peppermint hot chocolate, build a blanket fort, bake cookies, commit random acts of kindness, celebrate the solstice, go on a drive to look at Christmas lights, sing Christmas songs, watch a holiday movie, and enjoy the seasonal sights! Make Christmas cards, create a nativity scene, make handmade gifts, trim a tree, make Christmas ornaments, paint with winter colors, decorate for the holidays, and build a snowman... ornament! Christmas Gifts Kids Can Make Your Family Will Love! Set Goals for the New Year and Get Organized for Good! We We believe in the magic of childhood, the power of our dreams, spending more time outside than inside, and making this world a greener place to live!